The Havis Universal Tablet Mount allows for safe and secure mounting of a wide range of 10-inch tablets, and is ideal for the rugged industrial and healthcare markets. 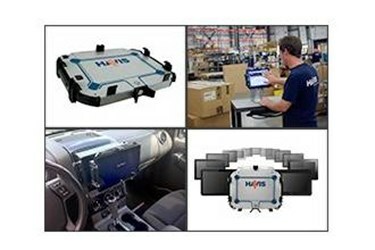 Warminster, PA (PRWEB) - Following February’s release of the Universal Tablet Mount, Havis Inc. has seen new opportunities throughout the year to expand into the industrial andhealthcare markets. Havis looks forward to gaining further traction in these markets as the company prepares for the new year. The versatility of the Universal Tablet Mount combined with Havis’ diverse line of mounting products gives users the freedom to securely mount a wide range of 10-inch tablets on various mobile workstations, including carts and forklifts. Havis recently confirmed compatibility with the Microsoft Surface, Dell Latitude 10 and HP ElitePad. Other compatible tablet manufacturers include Acer, Apple, Asus, Lenovo, Motorola, Panasonic, Samsung, and Toshiba. Tablets are integral components to successful industrial and warehouse automation, and Havis understands the importance of protecting this technology in rugged environments. Therefore, the Universal Tablet Mount has been tested to withstand crash simulations per SAE J1455 and is compliant with RoHS (Restriction of Use of Hazardous Substances) regulations. Havis also designed the Universal Tablet Mount, as well as other low-profile docking stations, to comply with medical wall mounting requirements, which allows physicians to conveniently mount their tablets in patient rooms, the nurses’ station and even operating rooms. These solutions feature an easy-to-use latch handle and barrel lock, which work together to keep the tablet securely mounted. Doctors, nurses and other healthcare professionals are now utilizing tablets to access and update medical and patient records and to transcribe prescriptions. These devices help eliminate unnecessary paperwork and minimize costly, and potentially error-prone, data entry. With the Havis Desktop Stand for Tablet Docking Stations, physicians can transition smoothly between hospital rounds, patient consultations and office hours. The Havis Desktop Stand can also enhance portability and improve productivity in a variety of mobile industries by providing a sturdy, anti-skid base for mounting the Universal Tablet Mount and other tablet docking stations on virtually any flat surface. To learn more about the features, specifications and certifications of the Havis Universal Tablet Mount, please visithttp://www.havis.com/universal-tablet-mount. Stay up-to-date on the latest products and announcements from Havis through the Havis Equipped Blog, LinkedInand Facebook. Havis Inc. is a privately held, ISO 9001:2008 certified company that manufactures in-vehicle mobile office solutions for public safety, public works, government agencies and mobile professionals. For over 80 years, the Havis mission has been to increase mobile worker productivity with industry-leading products that are built to the highest safety and quality standards and are designed with comfort in mind. Headquartered in Warminster, Pa., with an additional location in Plymouth, Mich., Havis currently employs 200 people. For more information on Havis, please call 1-800-524-9900 or visit havis.com.